As of December 10th 2014, Packs of 216 Buckyballs have ran out of stock. For every order of this product, we will be sending you 2 packs of Original 125 Buckyballs. Thats 250 balls for the price of 216! Hurry while supplies last!! Originals packs of Buckyballs are in stock and ready to ship. 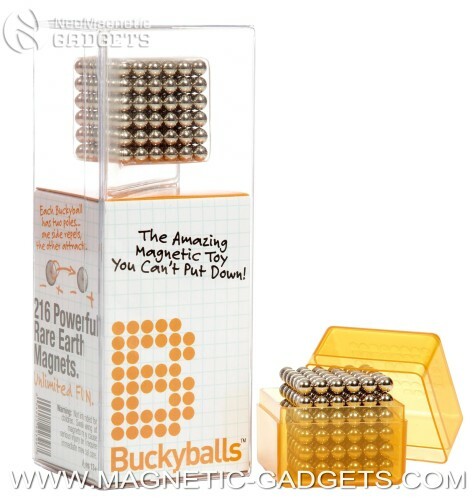 Magnetic-Gadgets.com is proud to bring you the original 5mm magnetic BuckyBalls in nickel finish. Buckyballs have been discontinued and are now considered a collector’s item. Buckyballs are not toys, keep away from children. Original sets of 216 Nickel plated Original Buckyballs are in stock and ready to ship. Beware of imitators. Original Buckyballs have been discontinued, we have very few sets left. BuckyBalls lets you create cool shapes like cubes, cylinders or just about any form you can imagine. Use the individual magnetic spheres to hold pictures, love notes or the kids’ drawings on your fridge. It’s a great desktoy, it’s an amazing gift , it’s the BuckyBalls!